On March 24, the Park Center for Independent Media at Ithaca College announced the winner of the second annual “Izzy Award.” Independent journalist and bestselling author Jeremy Scahill is the 2009 award recipient, an honor bestowed for his efforts to bring issues about Blackwater military contractors into the mainstream media. Byard Duncan, contributing writer and editor for AlterNet, interviewed Scahill about his views on independent media and the future of journalism. Scahill says that independent journalists are most effective when they are actually independent from people in power, whether politicians or heads of corporations. He also believes that the role of the independent journalist is to confront those in power and to give voice to the powerless. I think we’re at a moment where we have a lot of really good independent journalism that’s being produced by bloggers and independent journalists, but we also need to not go far away from that tradition of peer review, editing and fact-checking. We’re at a ground zero moment of how to save real journalism without succumbing to the ownership desires of large corporations or other corporate forces. They had to credit Marcy Wheeler, and put a quote from her, and cite her in their newspaper. That to me was a great moment in the recent history of independent media, because what it did was shame the corporate media. It said that a blogger with very little resources can out-scoop The New York Times on a very important story that was catching headlines at that time. Scahill, a Puffin Foundation Writing Fellow at The Nation Institute, is a two-time Polk Award winner, and a regular contributor to The Nation, Democracy Now! and AlterNet. His book, Blackwater: the Rise of the World’s Most Powerful Mercenary Army is an international bestseller. The Izzy Award is named after iconic investigative journalist Isidor Feinstein Stone (better known as I. F. Stone or Izzy Stone), who published his newsletter I.F. Stone’s Weekly during the height of McCarthyism in the ’50s. Last year’s winners of the inaugural Izzy Award were Amy Goodman of Democracy Now! and Glenn Greenwald of Salon.com. 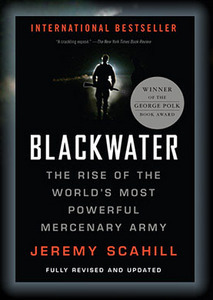 Image: Book cover of Blackwater: The Rise of the World’s Most Powerful Mercenary Army by Jeremy Scahill. Fair Use: Reporting.